What Every Gal Must Own! 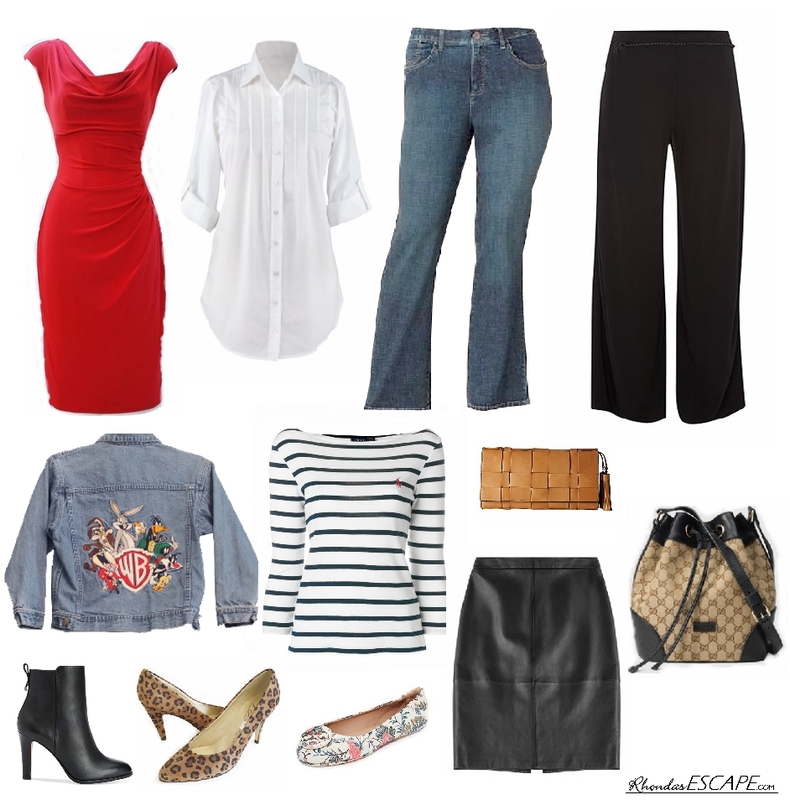 I was inspired last week by the "Style Nudge" fashion blog on "My Must Have 10 Wardrobe Items". Cherie has a great sense of style and provides great photos and fashion advice. I took her list and shopped my closet. I was surprised to find that many of the above items, per her suggestion, were all close to the front of my closet, in that they had been worn recently and frequently. So here is both my generic and specific list. RED: I love red and wear it when I am feeling bold and want to be seen. I even wore a red dress on a job interview and was told that after reading my resume the interviewer was not at all surprised to see me in red. I think a complement. A red sweater works with tan skirts/pants and red contrasts well with white. Don't be shy - be sure to have some red in your wardrobe. White Shirt/Blouse: Goes with everything. A silk blouse for dress, a casual pull over white top for play. It can be long/short sleeve or off the shoulder. It always looks great with jeans or dress pants. Every Day Pants: I have my every day jeans; wear anywhere/anytime. You can always grab them without thinking and pair with a casual top, graphic t-shirt or sweater. When dressy is needed, think black pants. You will never go wrong and they flatter every figure. Jeans Jacket: This was one of Cherie's suggestions and I have my Loony Tunes favorite always handy. For this South Florida gal it has been used on many long-haul airline trips and for our cool January and February mornings. Talbots has a nice Jeans Jacket available this season. Stripe Top/T-shirt: This pairs with everything and is an absolute must. I am ashamed to admit how many variations of a stripe top I have in my closet. My favorite is an off-the-shoulder, with built in bra. Skirts: If you must have only one let it be black, hitting at the knee or just above the knee. For business or a dress evening a must have/wear item. Paired with a white silk blouse, you will be ready for any event/situation. Leather: I love the feel of rich leather. MY preference is a leather skirt. It explores the region between elegant and exotic. Maybe for you a leather jacket or leather skinny pants if you are tall. Wear with caution, it will attract attention - Most important - wear it! Purses: Have a good quality bag for every day. One you can grab and it is ready to go. Your "day purse" has everything you need for an outing; touch-up makeup, phone, wallet, hair brush, etc. Do not go cheap here - Save-up if you must. This is an everyday item that makes a statement about the lady that you are. Always have another for evening/formal wear in the form of a clutch or small bag with an elegant shoulder chain. The shoulder strap comes in handy when standing and you must handle hors d'oeuvres and the glass of wine. Shoes: Basic simple black pumps or maybe ankle boots like above. Black will always look elegant and choose the highest heel you can navigate. Maybe a kitten 1" inch, or a 4" stiletto. Be sure you can walk like a lady in whatever you choose, stay with what fits with your personality and appropriate for the outing. Shoes are always a good place to add animal-print. Plus flats and sandals for casual are a must.